The Universal Barrier Operator has a beam length of just under 15 feet, providing secure access to any facility. It is protected from the elements with a rust proof housing and aluminum alloy boom arm, which can be oriented left or right allowing entrance or exit regulation. Our Barrier Operator sets a standard in ease of installation allowing the purchaser to do what the more industrial models would need a specialist for. The beam can be raise in 2-6 seconds making it nimble enough to service high traffic facilities such as parking garages while maintaining an aesthetic pleasing enough for your small business. Our aluminum alloy housing is, as mentioned, rust proof and weather resistant but also painted in classic red and silver. The colors are complementary to the color scheme used in stop signs and yield signs, as a subtle reminder for the motorists to stop and pay attention. The frame is strong enough to withstand the small dings and scrapes inevitable to appliances in a driving environment. The steel support that the beam arm attaches to is more than sturdy enough to withstand the pressures exerted on it on a daily basis. The steel support is also covered by a matte white plastic casing when fully assembled to maintain its superior aesthetics. 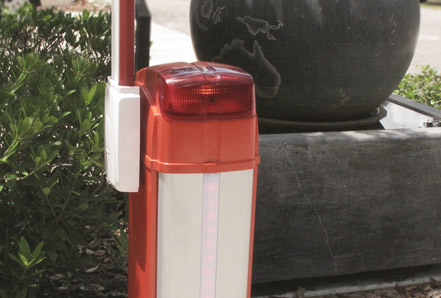 The Universal Barrier’s chassis is equipped with multiple safety lights, a feature not found in traditional barriers. The light strips along the front and back of the casing provide a constant source of illumination for your entranceway while the primary light on top blinks in coordination with the lowering or raising of the beam. This not only brings attention to anyone entering or exiting your facility but ensures that other motorists will be aware of the vehicle when passing it. This will greatly reduce the risk of collision on your premises. It also hints to a welcoming atmosphere not seen in the boxy industrial models found in most airports and parking garages. Despite providing the ease and cost of a simpler model our barrier gate offers many of the same features as the high priced competitors. Secure inside the chassis are input terminals for photocell, Airwave switch, loop detector, back-up battery (for DC Motor), toll gate system and output terminals for the primary lamp. All of these allow you, the owner, to tailor your barrier operator to your specific needs. In order to provide the customer with the greatest compatibility and reliability, we recommend Estate Swing products be used complementary to your Universal Barrier Operator though most other gate accessories will work with the barrier. For further recommended security accessories please view the compatibility page. User Agreement | Bookmark This Site | Sitemap © Copyright 2002-2019 Sequoia Brands,Inc.